This is a live post from Ark Group’s 11th Annual Knowledge Management in the Legal Profession in NYC. I publish live posts as a session ends, so please forgive any typos or failure to capture meaning accurately. Session Title: How Does KM Factor into the Strategic Fabric of the Firm? Session Description: Baker Donelson takes a holistic approach to firm strategic planning. In this keynote segment, attendees will hear from Jennifer Keller—Baker Donelson’s new President and COO. Taking the position in April, she is the first woman in this role and brings a unique perspective to the function of knowledge management in pursuit of the firm’s strategic goals. KM is an integral part of firm strategy. Jennifer’s background: My firm places a big value on its culture. We do not just talk it – we live it out. It’s not just that I am Prez & COO. Everyone, internal and external, tells me that. The culture values, transparency, excellence, a great place to work. The culture is key to understanding any initiative, KM included. The culture is a big reason why KM has worked at the firm. Background of KM at the firm… Started KM department in 2002. 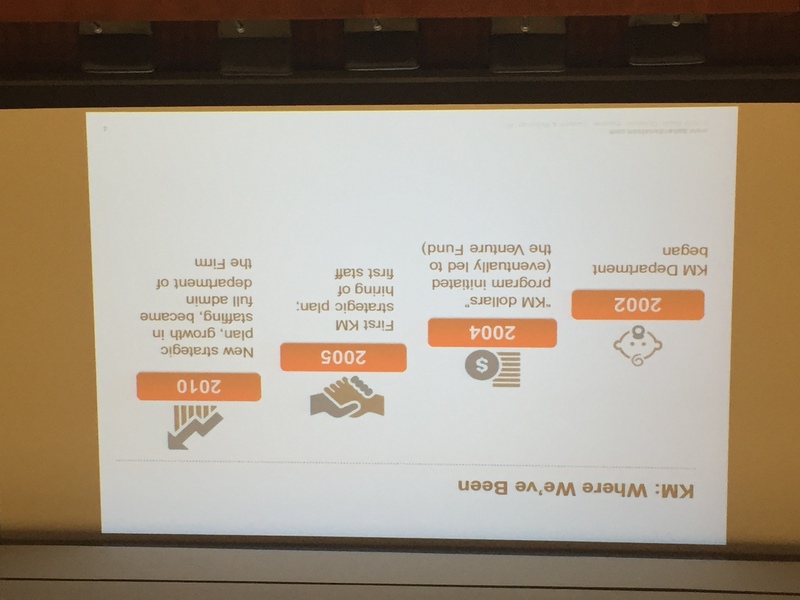 In 2004, started the KM fund, dollars for KM, which eventually led to Venture Fund (more later). In 2005, firm developed the first KM strategic plan. In 2010, a new strategic plan, growth in staffing, and KM became a full department of the firm. 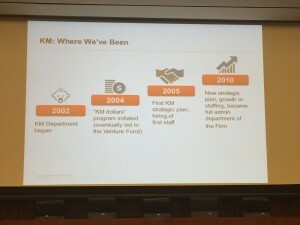 The strategy for KM in 2015 to 2019. With years of experience, lawyers have many specific requests for KM. The main points of new plan include KM consultancy – this is to make KM more like consultants, gathering requirements, analyzing opportunities. and developing products. This will be supported by KM tech and product development. And KM will re-engineer elements of the practice. Management looks at KM holistically. It involves many people. Says that a holistic approach is new in most firms. The traditional model is that the big rainmakers or best lawyers did the planning. Now, many more people are involved in strategy. So this involves practice groups, LPM, exec management, the board, and marketing. Implementation requires approval by the CEO, COO, or board. Approval process is fairly streamlined so that decisions / approvals do not bog down. Venture Fund is a key piece of the operational implementation. The firm decided to take significant dollars, budgeted at beginning of year, and put into a venture fund. Lawyers can request to have their working time “paid for” by the fund, as if it were billable. For example, when the firm started BakerNet (portal), it needed to populate it with content. Instead of asking a than small KM staff to do the content work, the firm offered working dollar credit for content curation. There is a rigorous review process for Venture Fund requests. There is a multi-level approval process. CKO Meredith Williams and her team audit all hours billed against the fund. The R&D budget has been relatively static but sufficent for annual needs. Evolution vs. Revolution: Focus on former, not latter. Acknowledge the psychology of lawyers. But it’s important to focus on efficiency, lower cost, higher profitability, and “productivity”. And this nomenclature is new for many lawyers. THe ability of KM to create simle, effective solutions is key – but how to pakcage and deliver is key and harder than it looks. Focus on Client Value: Seems self-evident but we define it concretely as lower cost, higher predictability, better outcomes, and more transparency. The firm then develops specific metrics for each these factors. For example, transparency can mean different things to different clients: per matter cost, matter progress, or overall portfolio view of matters. Don’t Forget the Importance of Support Staff and Other Admin Departments: Firm is very transparent with everyone. Remember that staff is key to execution. This also means seamlessly integrate across functions, particularly KM, LPM, and Library. Identify and Help Remove Obstacles: Lawyers love when you remove an obstacle for them. We look at what is working, what is not being used as much as we expected, and then adjusting to do more of the former and figure out why the latter not meeting needs. 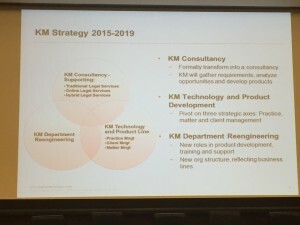 On latter, for example, Intranet was “too big”, and lawyers found that daunting. We fixed that by using “buttons” on home page (AKA mini-apps). So define an obstacle (too much information) and remedy it (simplify the user interface). Another example: firm provides a lot of in-person, one-on-one training to overcome perceived or actual obstacles. Cites CKO Meredith Williams as a big success factor for KM at the firm. 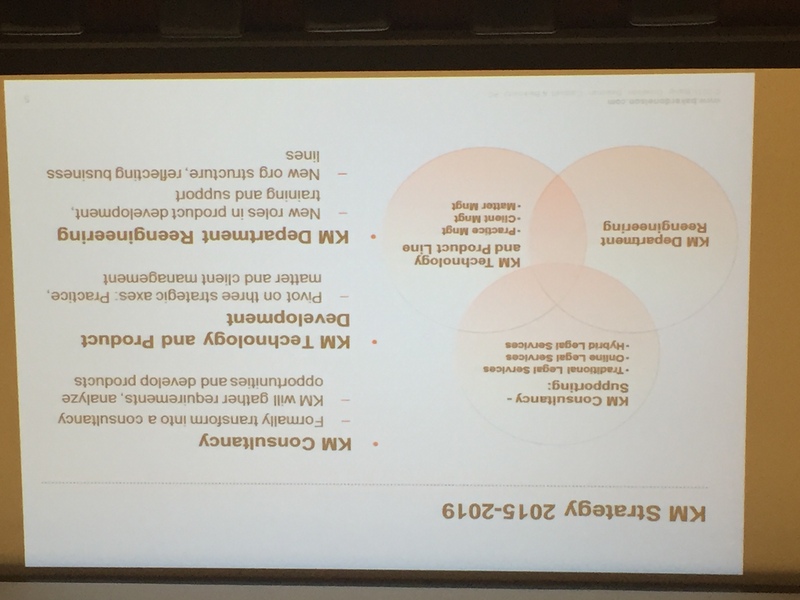 The firm is committed to KM, excited about its future.